Small rooms - Rooms that are smaller then 64 square feet (8' x 8') should utilize a fan with a 32" blade span. Medium sized rooms - If your room is up to 144 square feet (12' x 12') then utilize a fan with a 42" or 44" blade span. 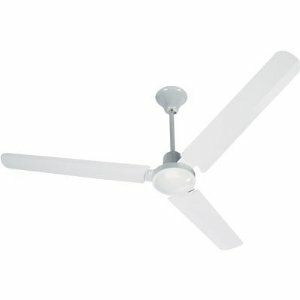 Large rooms - Rooms that are up to 225 square feet (15' x 15') should utilize a fan with a blade span of 50", 52" and etc. up to a max of 56". The span of each blade is important. You want a fan that moves enough air around to cool the entire room. Also, you want to avoid putting a ceiling fan that will move too much air around. Below we have recommendations on which fan you should install into your home, based on the size of the room you're installing in. These recommendations are based on the blade span of the fan - that length of each ceiling fan blade. The larger blades will move more air and thus, are to be installed into larger rooms. Usually fans don't go larger then 56" in blade span. However, some industrial and commercial fans can have blade spans up to and including 60." 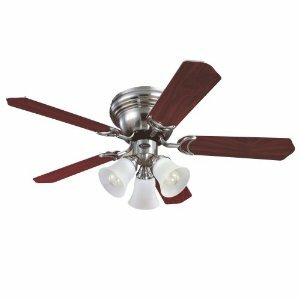 The Westinghouse 42-inch Contempra Trio Ceiling Fan features five reversible wooden blades and a light kit with three frosted glass shades. Part of Westinghouse's Hugger series, the Contempra Trio is made for rooms with low ceilings, and it works in medium-sized rooms up to 18 by 20 feet. Lighting fixture with a trio of frosted glass shades provides soft light. Operates clockwise or counterclockwise for year-round use. 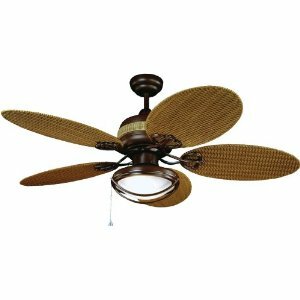 Contempra Trio ceiling fans are ideal for rooms with low ceilings. Contempra Trio provides year-round comfort and maximum energy savings. The Westinghouse Contempra Trio fan is one of Westinghouse's Hugger series of fans, which are specially designed for rooms with low ceilings. 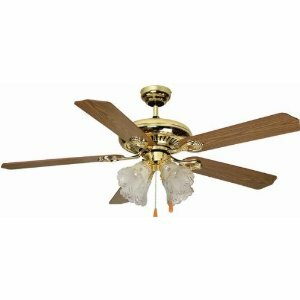 This 42-inch ceiling fan is best suited for medium-sized rooms, such as recreation rooms, living rooms, or children's bedrooms. Reversible Blades and Reversible Switch The Contempra Trio's five blades are reversible, so you can choose the finish that best suits your room's decor. The attractive wooden blades operate smoothly and efficiently. 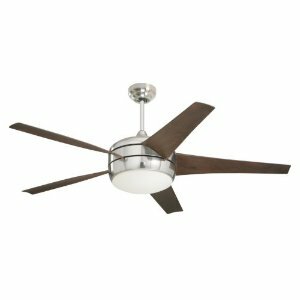 For year-round comfort and maximum energy savings, Westinghouse ceiling fans include a three-speed, reversible switch that allows the ceiling fans to be used during cool or warm weather. In the summer, keep your home cool by running your ceiling fan counterclockwise. In the winter, run your ceiling fan clockwise to circulate warm air from the ceiling, eliminating cold spots and drafts. Equipped with a light kit, the Contempra Trio fan features three lights that hang beneath the center of the fan. The lighting fixture's frosted glass shades provide a soft hue of light. If you choose, use compact fluorescent bulbs to increase efficiency and reduce your energy costs. 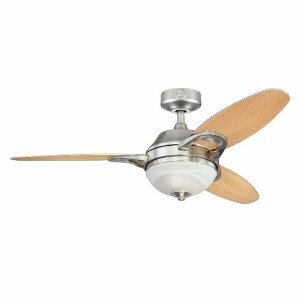 Perfect for imparting a casual, contemporary feel, the 46-inch Westinghouse 7877500 Arcadia two-light, three-blade indoor ceiling fan features a brushed nickel finish, frosted white alabaster glass light fixture, and beech/weathered maple reversible plywood blades. 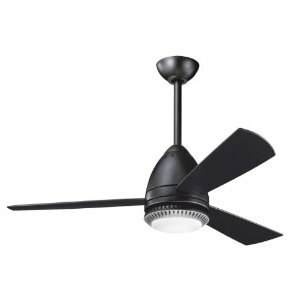 This fan features a whisper-quiet motor with a three-speed reversible switch that allows for customizing air movement. It also comes with a remote control for convenient operation. The fan provides airflow at up to 4,300 cubic feet per minute (cfm) at its highest speed. It is rated to operate at 52 watts at high speed (without the lighting on), which gives it an airflow efficiency rating of 82 cfm per watt. (As a comparison, 36-inch to 48-inch ceiling fans have airflow efficiencies ranging from approximately 71 to 86 cfm per watt at high speed. 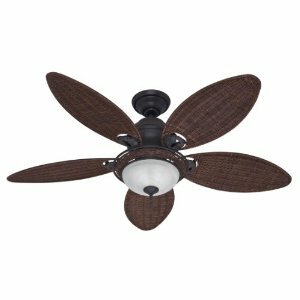 The Kichler 300121SBK Eva Decor 46-Inch Ceiling Fan updates a traditional design with a more modern style in a crisp Satin Black finish and Satin Black blades as well as the light from the Cased Opal glass shade on the integrated light kit. The 300121SBK can be used to complement a family room or bedroom as the focal point, or placed above your dining room table instead of the traditional chandelier with the bright light as well as the added benefits of air movement. The 300121SBK measures with a 46 Inch blade sweep and a 14 Degree blade pitch. This fan uses only 35-watts of electricity on high speed (Excludes lights), pushes 3505 cubic feet per minute, and 100 cubic feet per minute per-watt. This is sold one per package and comes complete with three blades, a 6-Inch and 12-Inch downrod, an integrated light kit, one 100-watt JD-E-11 halogen bulbs and a Cooltouch Control System for ease of operation if higher ceilings are an issue, or if you just desire the convenience. 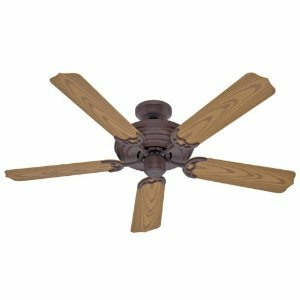 Height of this ceiling fan is adjustable using shorter or longer downrods. The TROPICAL BREEZE has a Chocolate Brown frame with a Frosted White glass light kit. Rattan Weaved Durable Plastic Blades are included in the box and ready for assembly. This particular fan includes (2) E26 CFL 13 Watt Fluorescent Bulbs. When it comes to passing inspection this fan is Rated for Indoor and Outdoor use (Wet Location) - UL, cUL, ETL, CE, TUV, and ROHS Certified and has a Limited Lifetime Warranty that is limited to the motor after the first year. 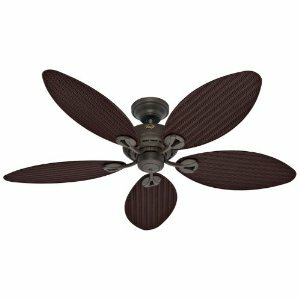 This fan is quiet enough to hear a pin drop and moves air at 3 different speeds so you're sure to find this a comfy addition to any room or patio. There is an optional Canopy Remote with receiver available for this fan that can not only control the fans speed but the lighting also if a light kit is installed.